Signs on North Texas tollways captured Wednesday by the NTTA. The North Texas Tollway Authority is promoting its free roadside assistance service with football-inspired messages to drivers. 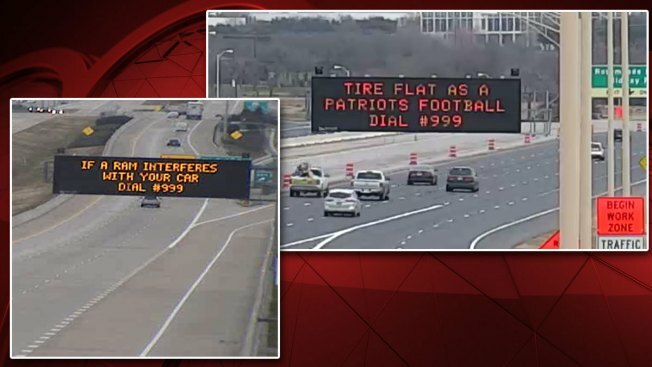 The NTTA posted signs that read "Tire flat as a Patriots football" and "If a Ram interferes with your car" to encourage motorists to dial #999 if they need help while on a North Texas toll road. The former is a reference to "Deflategate," when Patriots' quarterback Tom Brady was accused of intentionally ordering footballs to be deflated before a cold-weather playoff game in 2015. The latter reference is more recent -- citing a pass interference call New Orleans Saints head coach Sean Payton said the referees missed in the NFC title game against the Los Angeles Rams. The NTTA said it hoped to bring attention to safety in a lighthearted manner. The Los Angeles Rams and the New England Patriots will face off in Super Bowl LIII Sunday at 6:30 p.m. ET.